On this date in 1945 U.S. fighter-bombers attacked the Berghof, Adolf Hitler’s Al­pine retreat on the Ober­salz­berg near Berchtes­gaden on the Bava­rian-Aus­trian bor­der. The Berg­hof served as an out­post of Hitler’s Ber­lin chan­cel­lery, making it an ob­vious tar­get. Fur­ther north, in a less sym­bolic move, more than 1,200 U.S. bombers returned to the skies over Nurem­berg for the second time in two days. 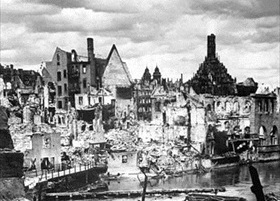 The city was an im­por­tant air­craft, sub­marine, and tank en­gine manu­fac­turing site and, from 1943 on­wards, was severely pum­meled in Allied stra­te­gic bombing raids. Just the month before, on Janu­ary 2, 1945, the RAF had sys­tem­at­ically bombed Nurem­berg. With­in an hour 90 per­cent of the medi­eval city cen­ter was destroyed, dis­placing roughly 100,000 re­si­dents, wounding 5,000, and leaving 1,800 dead. In the Febru­ary 20–21 raids, over 1,300 more residents were killed and a further 70,000 rendered homeless. The next day the Allies launched Opera­tion Cla­rion, a mas­sive day­time bombing attack by 10,000 air­craft based in Brit­ain, Italy, France, Hol­land, and Bel­gium to cut trans­por­tation lines in Cen­tral Ger­many and para­lyze the enemy’s capa­bility to con­tinue the war. 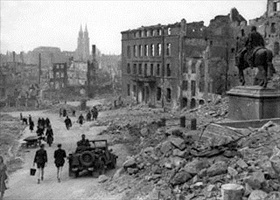 The Allies’ over­all sense was that Nazi Ger­many was on the ropes, and this only made the appa­rent vic­tors more ruth­less in their resolve to utterly destroy Hitler’s war machine and finish off his regime. The fire­bombing of Dres­den a week ear­lier, the fire­bombing of Pforz­heim near Stutt­gart two days after Nurem­berg, which killed a quarter of that city’s 79,000 in­habi­tants, and a raid on the Nazi capi­tal itself in broad day­light that killed 3,000 Ber­liners and left 100,000 home­less were making clear the price of on­going re­sis­tance to the in­evi­table capitu­la­tion of Germany. Unbeliev­ably, the fana­ti­cal deter­mi­nation of the Third Reich’s leaders to hang in there as the coun­try’s mili­tary situ­a­tion grew progres­sively more hope­less played out in sur­real scenes as ordi­nary Ger­mans tried to main­tain a sem­blance of normal­cy: on April 12, 1945, the Berlin Phil­har­monic per­formed a con­cert, filmed by crews from Joseph Goebbels’ pro­pa­ganda minis­try, less than three weeks before Hitler’s and Goebbels’ sui­cides and the uncon­di­tional Ger­man surrender by Hitler’s successor, Grand Admiral Karl Doenitz, on May 7 and 8, 1945. 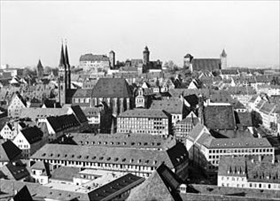 Left: View of Nuremberg’s Altstadt (Old Town) at the end of the 19th century. 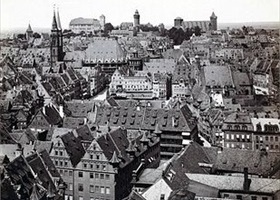 In the middle ground is the twin-spired St. Lorenz Church (Lorenz­kirche). During the 1930s Nurem­berg earned the nick­name “City of the Party Rallies” (“Stadt der Reichs­partei­tage”), for it was here that the Nazis held their an­nual party extrav­a­gan­zas cele­brating the achieve­ments of National Social­ism. The city was also home to over 120 arma­ment firms. From Septem­ber 1942 on, the U.S. Army Air Forces em­ployed a team of civil­ian econo­mists to assist with tar­get selec­tion that aligned with mili­tary and politi­cal aims of the war. The goal of the Enemy Objec­tives Unit was straight­forward: maxi­mize the effi­ciency and effec­tive­ness of U.S. air power to pro­duce the greatest effects on Germany’s war economy.